Here’s a more detailed breakdown of the primary characteristics and platforms that define each tier, from largest to smallest potential audience. Mass-market, utility-centric subscriptions dominate today’s headlines, and are usually the first services that come to mind when one hears the phrase “music streaming.” Examples include but are not limited to Spotify, Apple Music, Amazon Music, YouTube Music, SoundCloud Go, Pandora Plus, TIDAL and Deezer. The value propositions of these services are primarily utilitarian: unlimited skipping, offline and ad-free listening and on-demand access to a catalog of tens of millions of tracks. Genre- and geography-centric subscriptions embrace a more mass-catalog approach as well, but specialize in a specific genre and/or geographic region, tailoring both product and content features to the unique needs and consumption habits of their target audiences. Examples of genre-specific streaming subscription services include IDAGIO (classical), Primephonic (classical), Gimme Radio (metal) and Quincy Jones’ Qwest TV (jazz). 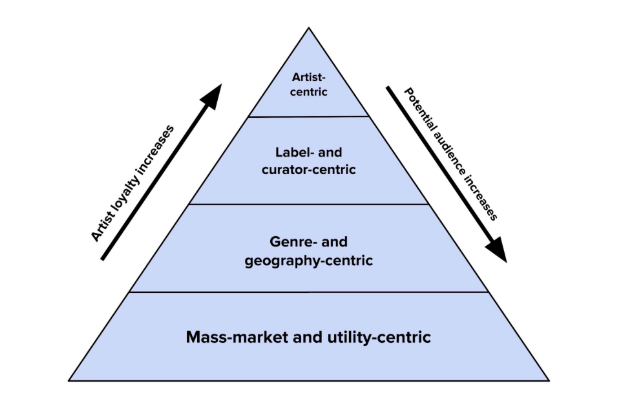 The remaining two tiers at the top of the pyramid – consisting of artist-, label- and curator-centric subscriptions –allow fans to subscribe directly to an individual artist, label, collective or third-party curator with a trusted perspective and taste. Two key components that separate these tiers from the other two are: (i) the absence of a massive catalog of thousands or millions of tracks, instead opting for a more limited, curated selection of content; and (ii) the clear identification of a human personality, perspective and/or community with whom subscribers can connect on a regular basis.